Sarah and her friend Poppy had come into London from Essex to see the aquarium. I met them outside the Tate Modern, sitting on separate benches and chattering giddily. When I introduced the idea of a portrait, their first eager question was if I knew where they could find a Pret A Manger for food. They had a whirlwind of energy, a charmingly chaotic pace to their questions and a sparkle in their eyes, and I knew we could get a super portrait. I shot chiefly with Sarah, simply because her scarf and hair were better coordinated to a background of ground-lit silver birch. I think I suggested the scene could look like a fairytale wood. Colin and Stoyan had kindly stood in as models as I setup a single softbox on a stand in front of the trees ten minutes earlier, and guarded it as I wandered along the river looking for a subject. We got a lot of great images, but this one – the first frame we shot – caught Sarah’s energy and character the most expressively. The trees also framed her best – cradling her almost with their lines. I wished I’d thought to ask why they’d chosen the aquarium for a visit – it seemed so unexpected and yet so appropriate a decision. Sarah and Poppy – thank you for stopping. I hope you found your Pret! This is portrait #38 of my 100 Strangers Project – check out the group page and get involved. 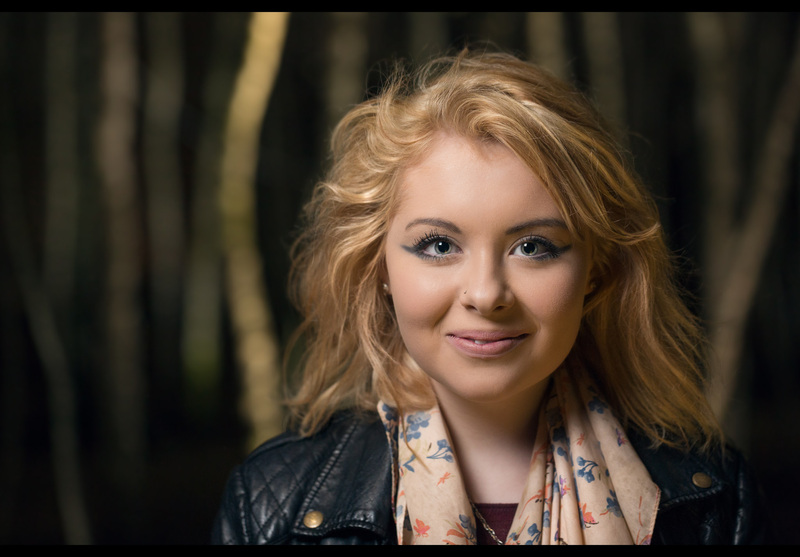 Canon 600EX-RT in 38″ Lastolite softbox, 45* up and left of Sarah, nearly point blank. Fired at 1/128, triggered by non-firing 600EX-RT on camera for focus assist. Gold reflector held by Stoyan camera right, low down angled up.